Tomorrow is opening day for firearm deer season. If you ride on public or state lands that allow hunting please be careful. Below are a few tips to make your rides home safely. • The best and easiest thing to do is ride where hunting is not allowed. 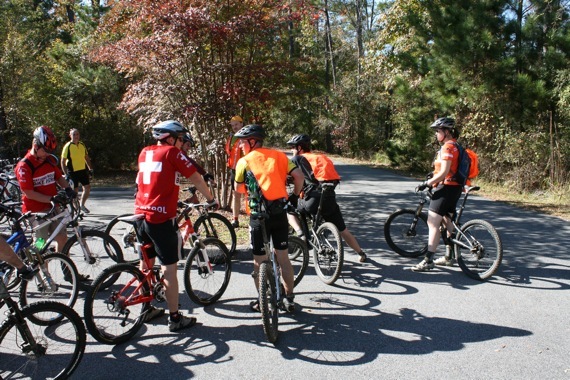 But, if you DO ride where hunting is allowed…..
• Wear orange and/or bright colors. You can pick up a cheap orange safety vest at most outdoor shops and it’s well worth the investment. Avoid wearing camo patterns on your clothes, Camelbak, etc. Avoid any brown, tan, earth tones, and especially white. You do not want to look anything like the flash of a deer’s tail. During turkey season, avoid red and blue. • Avoid wearing a white helmet, as it could look like the tail of a deer sprinting through the woods. If you do wear a white helmet, tie bright flagging tape or cloth to it for better visibility. • Avoid riding during dawn and dusk hours. It turns out this is prime hunting time, especially during deer season, plus the low light conditions make it difficult to make out colors and shapes in the forest. If you think you might be caught on the trail in the early evening, bring a light or two to make yourself more visible. The best time of day to ride during hunting season is mid-day. • If you’re riding with others, maintain a conversation so as to be heard. Hunters may not like to hear this but making noise with a bell or even your voice will let them know you’re not an animal. • Always carry a cell phone & make notes of your location via signage on the trail. • If you see a hunter, address him or her to make your presence known. Give a wave and make eye contact if you can. • Check for closures with local land managers. Some trails are closed to bikers at certain times to minimize conflicts with hunters. Make sure you know when those times are and observe them. • If you see a deer or a herd, make some noise to let potential hunters know that there’s a human in the area. A loud bike bell works. • Don’t forget to protect your dog too—it may be best to leave poochie at home during game season. • Be courteous and respectful of all outdoor enthusiasts, hunters and non-hunters alike. 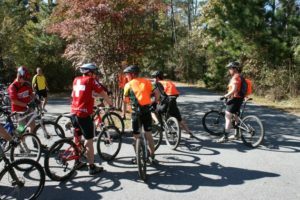 Remember that hunters usually only have access to public lands during limited times of the year; we cyclists usually enjoy access year round. • Before you head out during hunting season, educate yourself about safe hunting and backcountry practices, know and follow all rules, and be prepared. Above all, use common sense and do your part to share the woods safely—respect each other and the land we share.